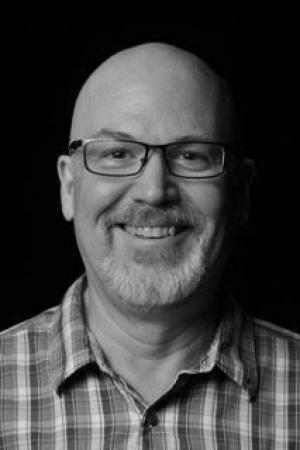 David Holcomb has been the production manager for the school of drama since 2003. He oversees production operations for the production laboratory experience for all drama students. He also teaches and mentors students in the Production Management emphasis of the Production Technology and Management option. David regularly teaches the following classes: Production Resource Management is a course outlining the fundamentals of Production Management; Production Data Manipulation is an advanced course covering the use of data in Production Management; and Production Management Workshop is a class exploring the synthesis of fundamentals as they apply to real-time management experience. David has previously taught Introduction to Lighting and Lighting Design 1, and coordinates many classes related to production lab. David has been a production manager since 1991. He has had long-term management positions with the Hartford Ballet, the University of Iowa, and the Pittsburgh Ballet Theatre, as well as shorter stints with Nickelodeon’s live entertainment division, and numerous festivals and events. David’s commitment to management education extends beyond CMU. He is a member of USITT regularly serving on panels. He is also a long time member of the Production Manager’s Forum, a group of production managers from around the country. Having gained important knowledge in the early days of the PMF, David’s role is now one of informing and educating newer members of the organization, as they make their transition from school or other areas of the profession into the role of production managers. He is also a founding member of the PMF’s mentorship program, a member of the diversity and inclusion committee, and the co-chair of the membership committee. David has a BFA in lighting design from Boston University, and is a lighting design member of United Scenic Artists, local 829. He has designed lighting for theaters from summer stock to Broadway, as well as for opera and dance companies and industrial clients.